New York, NY- It was a dagger in the making. Khalil Iverson broke away from Florida’s pressure, caught the deep pass in stride, and was heading to the basket with the ball. Wisconsin’s magical run was going to roll on. But nothing comes easy in March Madness. What started out looking like a game-sealing play turned into the start of the best ending of a game in the NCAA Tournament thus far, and it came under the bright lights inside The World’s Most Famous Arena. 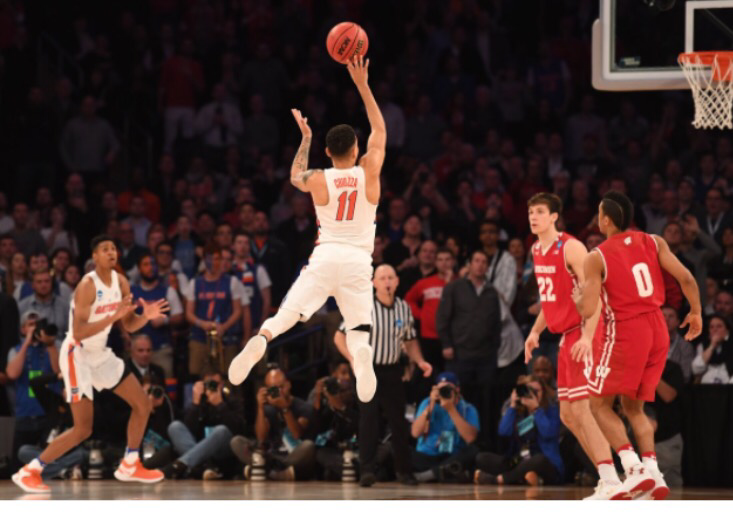 While Chris Chiozza’s game-winning, floating three-pointer is the shot that will live on in March Madness lore, it would not have been possible without Canyon Barry’s improbable come-from-behind block. The denial saved the Gators’ season, which will continue Sunday in the Elite Eight against South Carolina after Mike White’s team won at the buzzer in overtime, 84-83, over the Badgers. Iverson was on the verge of an easy deuce to make it a two-possession game, but Barry flew in with the rejection, giving UF the ball back and leading Chiozza to even the contest at 81 apiece with 24 seconds left. While Nigel Hayes gave Wisconsin the two-point edge with a pair of free throws with four ticks to play, the game did not even look like it would get to that point. For Barry, he compared the play to one that will live on in NBA history forever. “I channeled my inner Lebron James there,” said Barry, who compared his block to the legendary Game 7 rejection by the Cavaliers’ star, which helped Cleveland to its first title back in June. Much like Kyrie Irving followed that block up with the game-clinching trey, that’s the role Chiozza played in the action that ensued after the rejection to keep UF alive. The final minutes of the extra period displayed why March means madness in college basketball. Barry had next to no impact in the first 43 minutes of the game. “In this tournament, I haven’t played my best basketball at all,” he said following the game. Maybe Barry doesn’t even get back in if Justin Leon did not foul out with 1:40 to play. But that’s what happened, and Florida called on Barry to step in. He scored four of his seven points in that final stretch, with two of his signature underhanded free throws with 37 seconds left to get the Gators within two. “It’s the most emotional, up-and-down, roller coaster game I’ve ever played,” said Barry. Barry’s composure is another one of many examples of Florida’s wherewithal to hang tough this season. The Gators’ chances at a special run in March took a huge blow in mid-February when they lost standout center John Egbunu to a torn ACL. If you didn’t know about Florida’s resilience before early Saturday morning, you sure do now. The victory ended a Wisconsin senior class’ four-year span of dominance, which saw the Badgers win 115 games. To blow an eight-point lead and still hand Wisconsin its first overtime loss since February of 2013 said all that much more about White’s team’s ability to handle high-pressure situations. Lost in the back-and-forth finish was the fact that Florida trailed by 11 with just under eight minutes to play in the first half. To close the stanza on a 21-8 run against a Wisconsin team that is known for its lockdown defense really stood out. UF rolled from there, leading by 12 with 5:23 to go. That’s why this game was so wild – it looked like it was over. It looked as if we were heading to a boring finish on a boring night in an anti-climactic draw at The Garden. Mr. Barry sums up what ensued. Tip-off between the Gators and Gamecocks in the All-SEC East Regional Final will be at 2 p.m. at MSG on Sunday.